We were so Stoked!! to be able to work with Jeremiah Kille again on this project. You may remember the handprinted bike he did with us for the last NAHBS in Sacramento a few years ago. He did a brilliant job designing the finish for this special bike and Ollie at Dark Matter Finishing executed it perfectly! The patterns and colors draw from Jeremiah’s body of work, including some murals we commissioned here on our workshop walls. 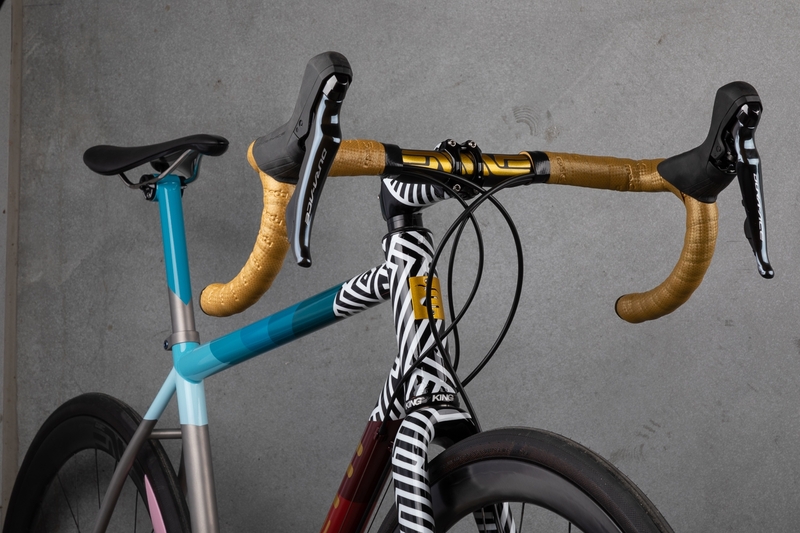 The finish spans the stem, frame, fork, seatpost. Jeremiah even hand painted a matching color section on the rear rim to match the “ray” effect of the color on the frame. He elected to use a gold metallic for the logos, including repainting the Enve logos on the bar in the same gold and our head badge. We used gold bar tape, a gold chain, and some super cool ceramic bearing derailleur pulleys from Kogel, in GOLD, on the Dura-Ace rear derailleur. Oh, it’s not just a work of art, but a great riding bike too! This is a 55cm frame in our Adventure Road format, our most popular model. It’s a quick and comfortable bike that excels when the roads get bumpy and steep. A great modern all-road bike and able to take up to 38mm tires when you want to explore dirt roads. ENVE SES 3.4 wheels, tubeless, with Chris King R45 hubs and Hutchinson Sector 32mm tires.